The San Salvador Replica Floats – But Has Its Mission Been Sunk? 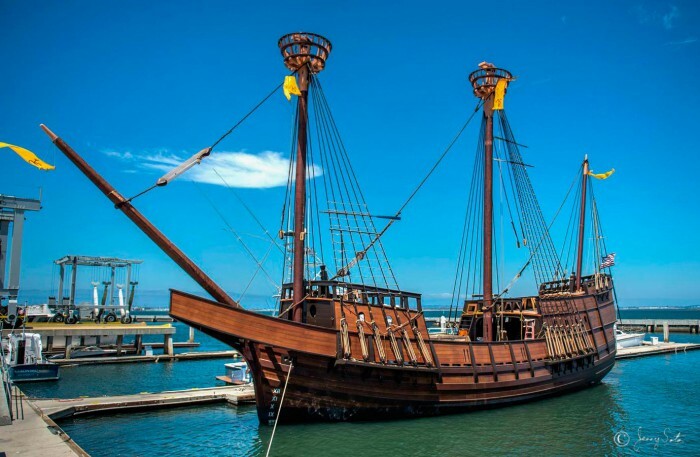 Around mid-afternoon today – Friday, September 4th – the replica of the San Salvador – Juan Rodríguez Cabrillo’s flagship galleon – will be motored out to lead the 10th Annual Festival of Sail – opening the gala nautical Labor Day Weekend. The ship, which cost $6.2 million, built mostly with thousands of hours of labor donated by the some 400 volunteers, and 2 years behind schedule, will not have sails itself, as the rigging is still being prepared, but it will be powered by an auxiliary engine. The parade also features the Californian, the state’s official tall ship, and one of the central exhibits of the museum. Other tall ships will be sailing into the San Diego Bay for the festival, from LA, Dana Point and San Pedro. With the numbers as high as 125,000, many locals and other spectators are anticipated to line the shores watching the annual entry, from along Point Loma, Harbor Island, Shelter Island, Coronado and the Embarcadero. Leading this nautical procession from around 3 p.m. to roughly 5 p.m – it’s hoped – will be the San Salvador. 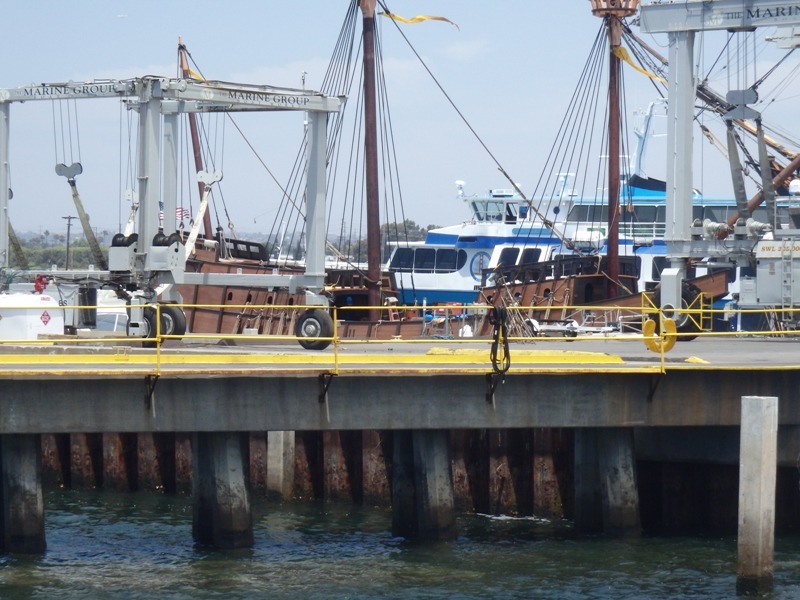 It has been resting at the Marine Group Boat Works since late July in Chula ever since it slid off its platform at Spanish Landing and floated down to South Bay on a barge. Starting today, Friday, it will be a Labor Day Weekend of festivals, fun, sailings, exhibits, crowds, and money-making off tourists, and of showcasing more of San Diego’s “heritage”. Robyn Gallant – the PR person for the Museum – told local NBC 7 a major part of the launch of this ship aims to educate the public about American history, and in particular about the origins of California. Gallant emphasizes that Cabrillo was the first European explorer to make contact with the West Coast of North America and to establish a relationship with the indigenous populations. A plan for a “grand public launch” in April had to be scrapped. Construction, even with hundreds of skilled volunteers, has taken longer than anticipated. For one thing, no plans for the original are known to exist. Beyond some last-minute construction, more fundraising is needed to provide about $500,000 more, [project manager] Montijo said. About a third of the money so far has come from the California State Coastal Conservancy, the rest from foundations, companies, individuals and more than 500 small-scale donors. Mark Montijo, the Maritime Museum’s vice president and chief administrative officer, likes to point out that Cabrillo landed in San Diego Bay 78 years before the Mayflower arrived at Plymouth Rock. San Diego has long laid claim to the legacy of Cabrillo, considered by historians as the first European to set foot in California. A 13-foot-tall statue of the explorer adorns the Cabrillo National Monument at the tip of the Point Loma peninsula; a festival each year reenacts Cabrillo’s wading ashore at Ballast Point. 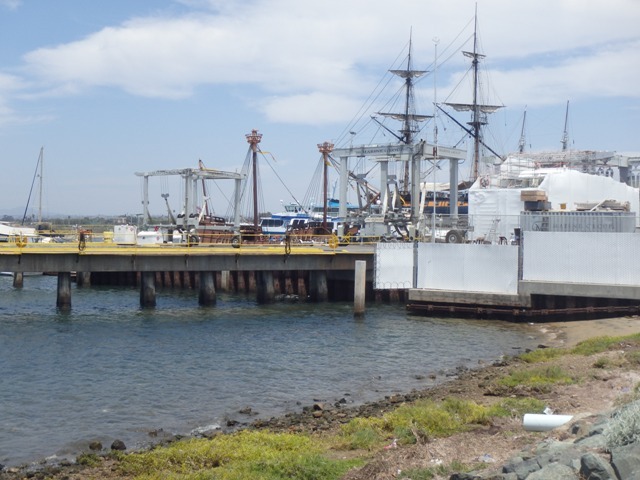 Cabrillo is in the “DNA of San Diego,” Port Commission Chairman Dan Malcolm told a gathering when the San Salvador replica was moved by barge from Spanish Landing near Lindbergh Field to a boatyard in Chula Vista, from which it will launch to lead the parade. It has been proven that the San Salvador floats – and today will see whether it’s engine works and it actually move on its own power. But one has to wonder – what with all the delays, bad weather, funding gaps – has the original mission of the ship been lost in the scramble to ensure its completion? We now know that the San Salvador floats – but has its mission being sunk? The ship is touted as a floating classroom for schools and museums up and down the West Coast. But most of the emphasis – so far – has been making sure the classroom floats – not what’s in the classroom or in the educational materials. Perhaps due to all the delays and funding gaps, managers at the Museum felt they had to focus on the building and launching of the ship itself, jettisoning everything else – even if temporary – as lesser priorities. According the Museum’s overview of the San Salvador project, the Museum wanted the replica built “because the ship will allow the Museum to tell a story” that will join strands – included the historical and cultural “in an integrated manner”. San Salvador will help us to make vivid the cultural and historical realities of the life of the Kumeyaay and that people’s own relationship with the sea for millennia prior to San Salvador’s arrival. We are raising the issue of the ship’s educational program – or rather lack of it – because there has not been any mention of the Kumeyaay people in the latest rounds of PR about the ship, its launch and the heritage that the ship and Cabrillo symbolize over these last couple of months. In fact, the absence of references to the native people and the role the Spanish played in the total destruction of their livelihoods and way of life leaves a huge question of just how well the San Salvador will perform as a floating classroom. Just because one can ignore our history of “ethnic cleansing” and the basic annihilation of the native peoples and get away with it, doesn’t mean you should. How can Cabrillo and the San Salvador be discussed without discussing the Kumeyaay and what happened to them by the series of European-based occupying cultures? So, even though the focus has been on getting the job done, getting the ship completed by these deadlines (Festival of Sail, etc), any progress on developing an educational curriculum has apparently collapsed. As an instructional tool to educate modern San Diegans and Californians about Cabrillo’s legacy, the classroom doors are still locked . Once completed, the vessel is to be a replica of a ship built under brutal conditions with Indian slave labor under the command of the conquistador Juan Rodíguez de Cabrillo. …The project is an attempt by the San Diego Maritime Museum to celebrate Spain’s shipbuilding prowess, and navigational skills, while ignoring the fact that the original ship, and many others, were built in Guatemala using Indian slaves. Doing a little research, one will find that Cabrillo is actually not someone to celebrate or emulate. It’s almost like Cabrillo and his symbols – like the San Salvador – have become the statues of Confederate generals and flags – objects of a racist past that deserve to be removed. Yet for San Diego’s and Point Loma’s Portuguese community, Cabrillo is almost like their patron saint, one of the few local symbols of their heritage. And like the Italian-Americans who hold onto the celebrations of Christopher Columbus as links to their heritage, local Portuguese-Americans cling to Cabrillo – despite a growing disdain among San Diego intellectuals and certainly among native peoples for what he represents. Cabrillo was a slave-owner and Conquistador responsible for the deaths of many native warriors and their families. His ship was built with (talented) slave labor. Should San Diegans begin to remove his name and statute from our edifices and schools or should we use the San Salvador as a tool to really explain the origins of the European people here and what happened to the Kumeyaay? Stop your bashing of the past. Stop fomenting hatred and loathing for people who were slaves to their corrupt governments. Stop the socialist diatribes that urge greater power to the evil governments that have caused all the bloodshed or the past and present. You’re not even funny anymore. Well, George, why don’t you tell us what you really think? Those who don’t learn from the past are bound to repeat it. A beautiful ship but why did it cost so much if there were so many volunteers? Who was paid all that money? Spanish Landing where the ship was built is a mess. Hello! Please remove the junk left at this area/construction sight. Thank you!